For more than 60 years, A Tool Shed has been the equipment rental solution for all our clients rental needs. Since we opened our doors in 1945, we have been offering our customers a large rental inventory with an extensive selection of rental tools from the novice do it yourselfer to the skilled contractor. Since the beginning, we have grown and now have seven convenient equipment rental store locations in Northern California. Our company has been built and maintained based off of the requirements of our customers from day one and fast delivery services are just a phone call away! Having friendly, attentive, and well qualified equipment rental specialists that take pride in getting to know their customers and allowing them get to know us in return. Getting personalized attention every step of the way to meet your specific needs. Offering the best quality rental equipment at the best prices to accommodate any project or budget. Helping our customers select the right equipment for the job. Utilizing our equipment rental specialists to give advice, suggestions and referrals to make the projects easier. Never charging sales tax on rentals! No environmental or hookup fees. A Tool Shed believes that anyone can successfully complete a project with the proper tools and rental equipment at an affordable price, without sacrificing the quality of the equipment they use! Our primary goal is to ensure that our customers, above all, feel comfortable and always leave one of our locations satisfied knowing that they received the best service available. For more information about A Tool Shed, please visit our website or give us a call at (831) 359-4769. 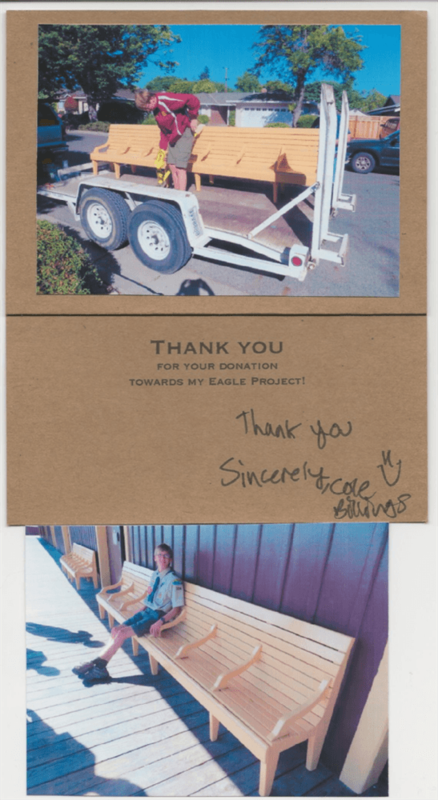 A written note from an Eagle Scout! Thank you, A Tool Shed!